A subtle blend of stone and glass, perfect for both bathroom or kitchens. Be bold and make a statement. Suitable for both kitchen and bathrooms. A classic mosaic tile design suitable for both bathrooms and kitchens. A modern mosaic tile design, in a stylish brick bond structure and available in two colour ways,Silver and Rose Gold.. Contemporary mosaic brick tiles suitable for both bathrooms and kitchens. At stunning collection of brick and linear glass and metal tiles. Leading the way in creativity and design. New to 2019, you can now visualise a number of our mosaics. Try it now! Want to make an impression? Then adorning your walls with mosaictiles is the way to go. Need to inject some interest into your home. A splashback is convenient way of doing this. Breaking up plain and boring tiles is easily done using mosaic tiles a border or an upstand. Need some inspiration, or you are just not quite sure which mosaic tile will suit your kitchen worktop. Explore our style and guides to mosaic tiles, where we take an indepth look at colours,materials,sizes and rooms. In this guide we take a look at different materials used to create mosaic tiles. Take a look at out handy colour guide for mosaic tiles. See what best suits your home. Here at Mosaic Village, we understand our customers want the best quality products at the most competitive rates. Therefore, we offer an incredible selection of bathroom mosaic tiles and kitchen mosaic tiles, all of which come in a variety of colours, sizes and materials. To suit your needs and achieve your ultimate home décor goals, our mosaic tiles come in a range of different materials and purposes. Our glass mosaic tiles are perfect for bathrooms as they are incredibly easy to clean. If you are wanting to achieve a simplistic yet statement like feel for your bathroom then introduce our brick mosaic tiles or maybe our mixed mosaic tiles for that extra glam feeling. Alternatively, to decorate your kitchen our metal mosaic tiles can add a certain sparkle or bronzed feeling with the addition of metal being highly heat resistant and easy to clean. If a statement wall isn’t for you then adding a simplistic border tile would be perfect. Mosaic border tiles are perfect to run along your kitchen wall or above your bathroom suite. 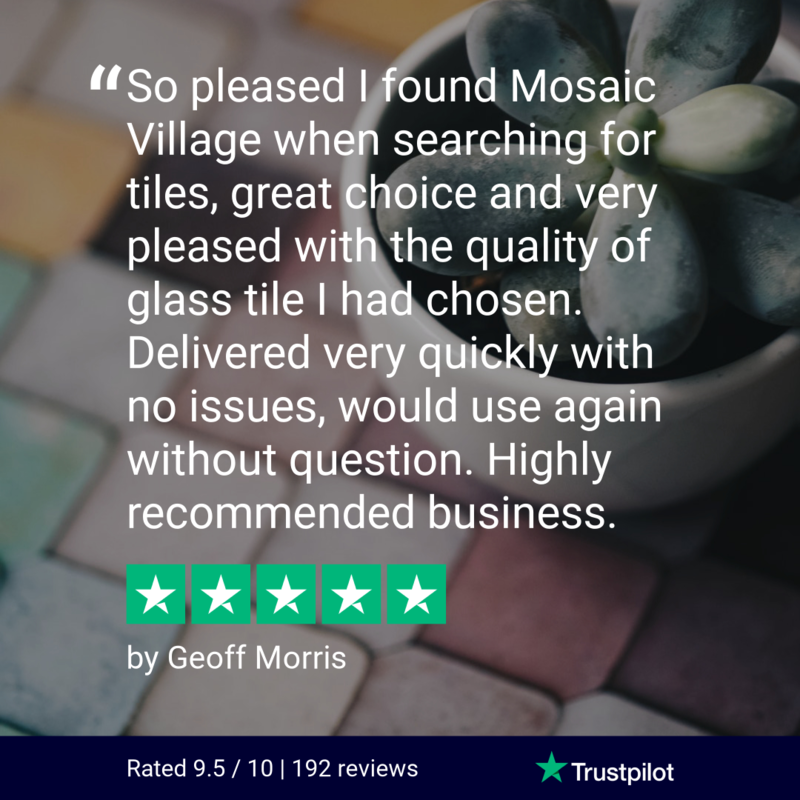 If you just aren’t sure on which mosaic tile would suit your needs, why not try our mosaic tile sample service, you choose your sample, we pack, send and delivery it straight to your door. You can shop safely with us! Rest assured when placing an online order with us. We are in partnership with some of the leading payment platforms and review systems. We are also proud members of the Tile association. Whether it is a question about one of our products or to help you with payment, our friendly support team our on hand to deal with your request.